BOYDS, Md. 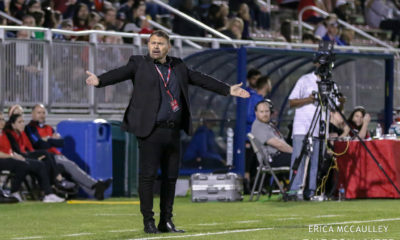 — For the second time in as many meetings, the Washington Spirit drew the Boston Breakers 1-1 Saturday night in front of 4,027 fans at the Maryland SoccerPlex. Unlike the first meeting, it was midfielders rather than forwards that provided the goals. 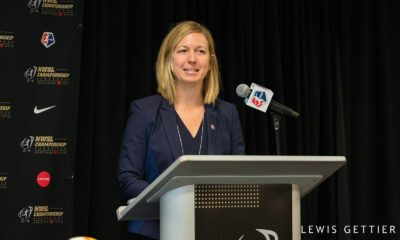 Joanna Lohman scored for Boston while Lori Lindsey notched a top-corner goal for Washington. The Spirit came out in a 4-4-2 formation with Stephanie Ochs and Tiffany McCarty as the frontrunners, for the first time all season. Washington’s formation change paid dividends as the squad played their best soccer thus far. Washington head coach Mike Jorden said he is still figuring out the best spot for Ochs. 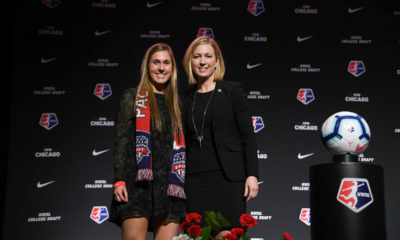 “She’s such a dynamic player we thought we’d move her around a bit whether she’s in wide spots or like tonight when she was up front….and you’ll probably see a bit more of that down the road,” he said. The improved side made plenty of mistakes, however, and Lohman made them pay for a defensive lapse in the 24th minute. Lianne Sanderson fed the ball to Lohman, who was wide open at the top of the box. Lohman easily put the ball away for the score. Washington held the ball better than they had in the first half in weeks past but still had problems connecting passes in the final third. 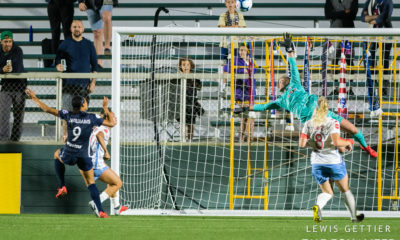 On at least three occasions in the first half, passes intended for Spirit players were easily collected by Boston’s goalkeeper Ashley Phillips. Both sides were forced to make substitutions at the start the second half. Boston subbed forward Adrianna Leon on for Katie Schoepfer, who knocked heads with Washington’s Tori Huster in the 29th minute. Schoepfer left the field of play for a few minutes but returned to finish the half. Washington subbed Kika Toulouse in for Candace Chapman, who made her first appearance for the squad after recovering from knee surgery. The Spirit also subbed Domenica Hodak on for Ali Krieger. Although making so many changes to a backline is not ideal, the youngsters proved up to the challenge. Washington held Boston to one off-target shot in the second half. 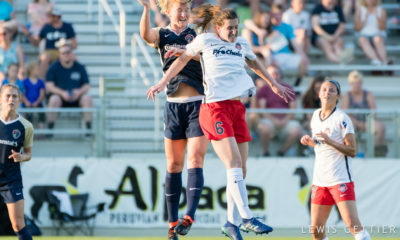 Lindsey provided the spectacular equalizer for the Spirit in the 50th minute. Diana Matheson intercepted a pass by Julie King and then found Lindsey just outside the box. Lindsey took a few steps and rocketed the ball into the upper left corner of the net. Matheson nearly added another goal to the Spirit cause in the 53th minute. Matheson took a shot from 17 yards out that initially got saved by Phillips but then rolled away from the goal. The Spirit put Boston’s injury-depleted backline under intense pressure throughout much of the second half. Kia McNeil was slated to start at center back for Boston but was a last minute scratch. Melinda Mercado, who was recently acquired by the Breakers through a trade with the Flash, got the start. As the game progressed, the Breakers started to rely more heavily on long balls to generate offense without much success. 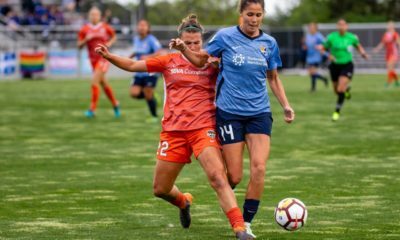 Boston did have an opportunity to notch the game-winner when Heather O’Reilly forced a Spirit turnover in the 84th min and crossed the ball into the box. The ball got by Kyah Simon and fell to Sydney Leroux, whose shot went well over goal. Leroux couldn’t quite get on the end of a cross two minutes later for Boston. 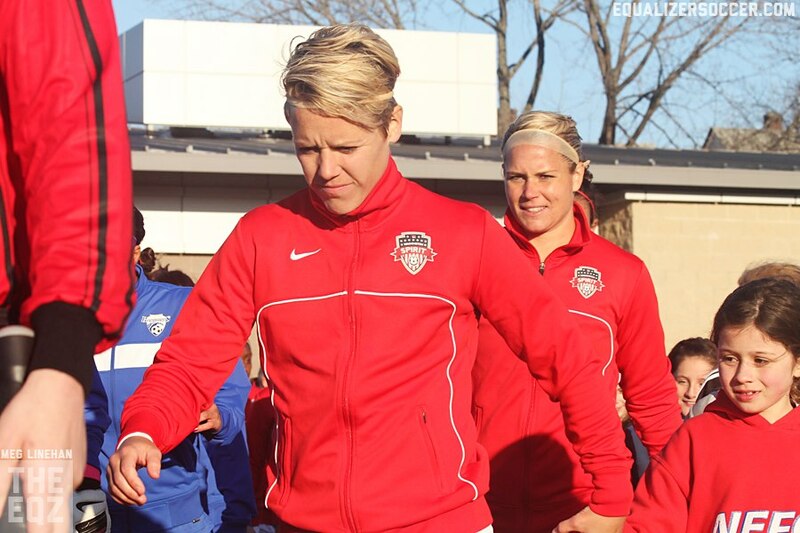 After the game, Leroux admitted she was frustrated as the lone forward battling four defenders. The best late opportunity of the night may have come from the Spirit’s Caroline Miller, who nearly scored in the 89th minute when she took a shot at the top of the box. Phillips made a fantastic diving save to keep the game level. Washington now hits the road for a three game road trip. They will face the Seattle Reign this Thursday. Boston will also be on the road next week as they face Kansas City FC next Sunday.